Odd-shaped hardboard piece to close "the gap"
When I originally built the Talheim station base board, I didn't intend to create the operator pit in the middle of the layout. The area was supposed to become a lake and the Welzbach ("Welz creek"), which gives the Welztal it's name, would provide power to a small watermill. 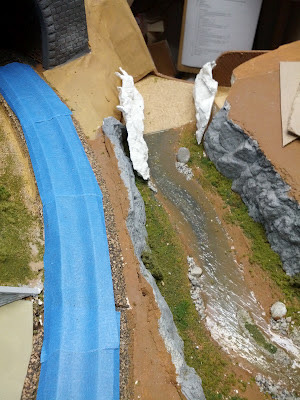 Well, ... that didn't quite work out as planned and when I installed fascia inside the pit, there was a three inch gap between the end of the creek modeled into the station base board and the fascia. Several months ago I built up the hill next to Tiersteintunnel and covered it with masking tape. A few weeks ago, I cut a piece of hardboard to fit the gap, and glued it in place. Last week I started laying out some left-over Hydrocal rocks, and finally today I plastered everything in place (well, actually I used Scuptamold for the last step). Now it's on to add some paint to the rocks and creek bottom. Hydrocal rocks fit in and set in place with Scuptamold. The photo above also shows a close-up of the ballast I added last week. Finally, an overview shot of the tunnel entrance to staging. 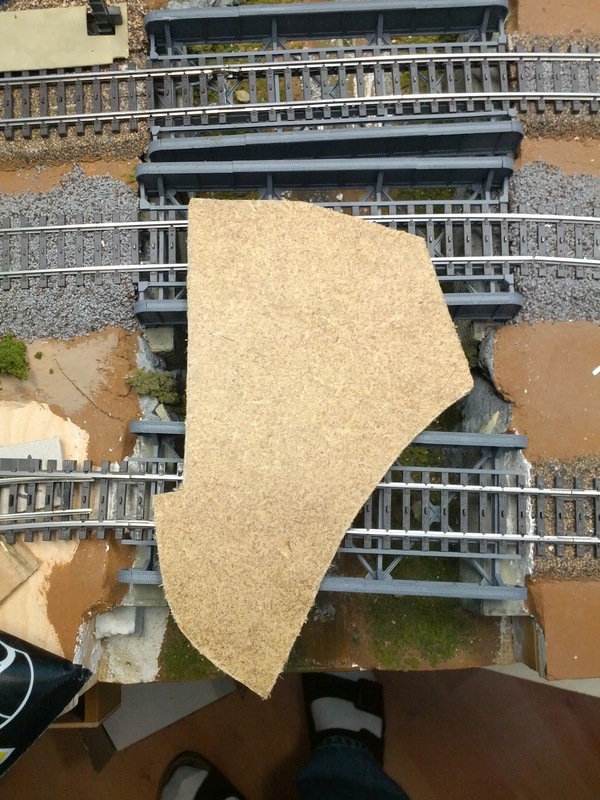 I closed the gap in the base board along the tracks, placed some support columns, and added the retaining wall next to the background. 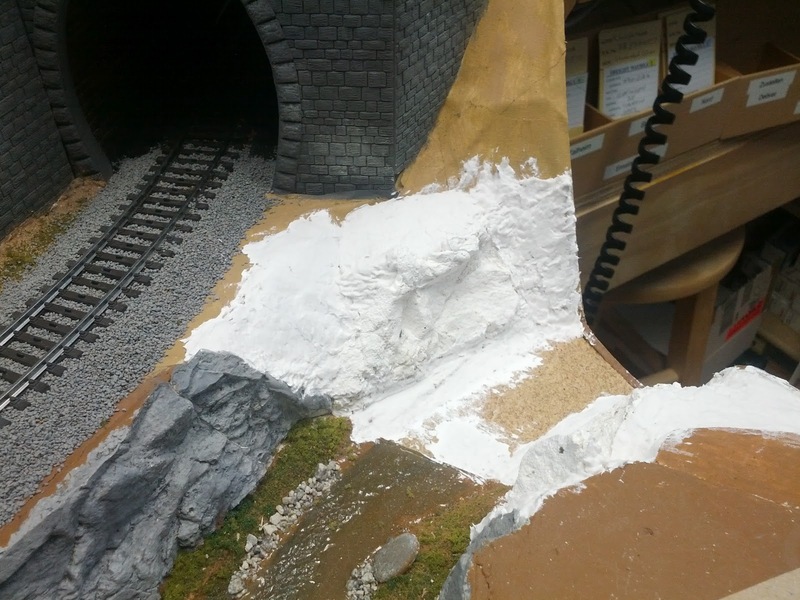 The retaining wall is salvaged from my Dad's dismanteled layout, and still needs to get painted. 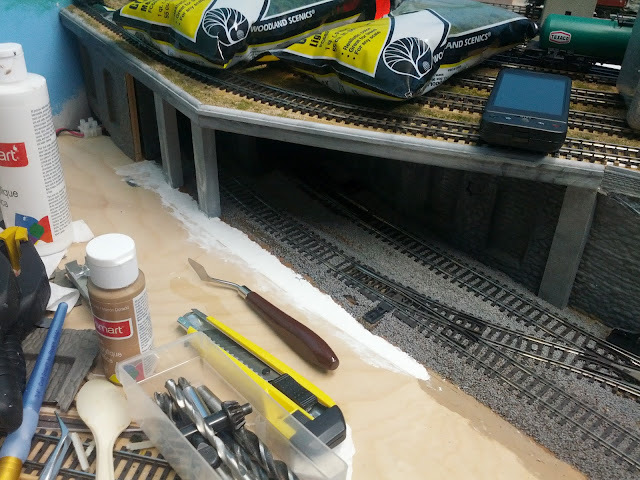 There's a connector for track power for the Emsingen yard tracks, which will be hidden under the boiler house of Werner & Soehne later. Tunnel entrance to staging. The two tunnel portals are not visible from this perspective. Tools and paint occupy the site of the Werner & Soehne machine factory.